For years, Sausalito had struggled with its success. Tourists on rental bikes flood the town every summer, creating a logistical and transportation nightmare for the small city. Recently, attempts by the city council to cope with the challenge have been less about addressing the issue and more about resentment against tourists, cyclists, and the ferries they rely upon. The City Council looks set to vote its opposition to an expanded Golden Gate Ferry facility and has already expressed opposition to a National Park Service ferry to Fort Baker. Sausalito is part of the natural loop of bike-riding tourists to San Francisco: rent a bike, cross the Golden Gate Bridge, head down to Sausalito, hang out, then take a ferry back. Simple, easy. But downtown Sausalito is a tightly constrained place. Bridgeway, the only road running the full length through downtown, doesn’t have the facilities to handle its bike traffic, and so it spills over onto sidewalks, rankling locals. According to Marinscope, some ferries have to leave for San Francisco half full because of the sheer number of people with bikes. As far back as 2009 at least, the more colorful described these bike-riding tourists as “locusts.” In 2015, conservative councilmember Linda Pfeifer proposed limiting the number of people on bikes from entering the city. Sausalito isn’t the only place with tourist problems. Tam Valley has been groaning under the weight of tourist traffic heading to Muir Woods along Shoreline Highway. Sharon Rushton, a political ally of Councilmember Pfeifer, has been fighting the National Park Service’s proposals around the national monument for years, whether it has meant fighting shuttles, parking, or parking management. 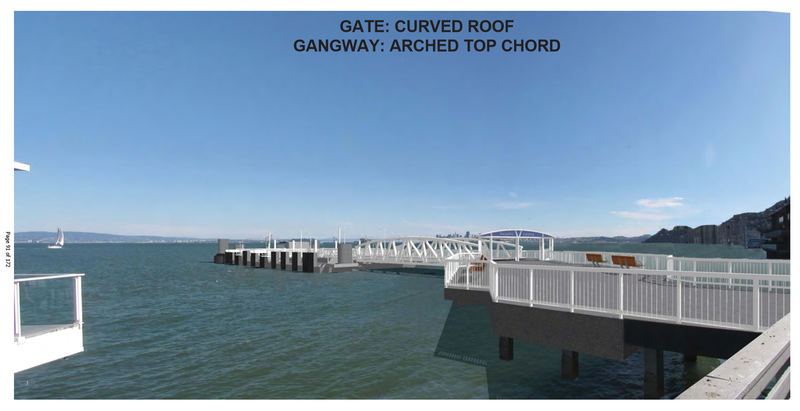 To help address the number of people taking the Sausalito Ferry with bicycles, GGBHTD has proposed expanding its Sausalito terminal. The proposed ferry terminal redesign from the air. According to planning documents (large PDF) the new terminal would allow a fully-loaded Spaulding ferry, which can accommodate up to 750 passengers with up to 100 bikes, to unload in 3 minutes and load in 6. This is a dramatic improvement over existing conditions, where ferries are reported to sometimes leave half-full. As well, the new design would allow passengers with bikes to load simultaneously and separately from those without bikes, reducing some of the friction that causes delays in off-loading at San Francisco. But the proposal has raised hackles with the council. Those opposed to the redesign aren’t happy with the final pier’s distance from shore and the amount of water covered. They’d like GGBHTD to begin regular dredging of the area so ferries could come closer to shore. The existing ferry terminal, as seen from the Yacht Club. The proposed ferry terminal, as seen from the same angle. To my eyes, the new design looks only slightly more intrusive than the old; it’s unclear to me why adding an additional and ongoing expense of dredging would be necessary. Perhaps a commenter could enlighten me as to the downside of the new design’s size. 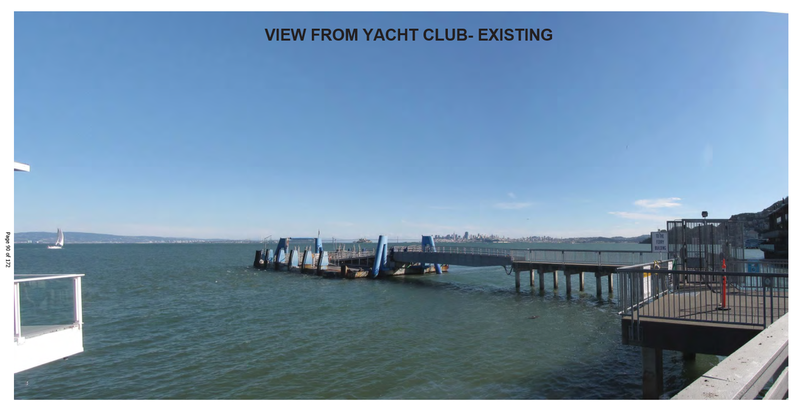 This is not the only ferry project that may happen around Sausalito. A National Park ferry at Fort Baker? Two miles south, the National Park Service (NPS) is interested in building a new ferry terminal at Fort Baker. While details are sketchy, the NPS has said the ferry would be operated by the same company that currently operates Alcatraz service. According to Marinscope, the terminal would only be used for “special events” and would not include a parking lot. According to the San Francisco Chronicle, this is part of a larger project to add ferry service to water-adjacent NPS sites around the Bay, including Rosie the Riveter National Historic Park in Richmond. It would allow NPS to focus tourist traffic towards ferry service rather than the current collection of ferries, shuttles, and parking lots. Having a ferry terminal at Fort Baker, even just for special events, would create traffic on both Alexander Avenue and Highway 101, exacerbating an already intolerable traffic situation… The increased traffic would place strains of vehicle movement and parking. Adding shuttle buses to the mix would also increase congestion on busy Sausalito streets. It is pretty obvious what the strategic goal is… I can see over time they will be directing the overflow [from Alcatraz] to Fort Baker and shifting those folks to downtown Sausalito. The concerns expressed by Politzer and Pfeifer echo Rushton’s complaints about the NPS and Muir Woods. Through her organization, Sustainable TamAlmonte, Rushton and others have advocated to limit the absolute number of visitors to Muir Woods per year and has opposed efforts to expand local shuttle service, saying that such ideas amount to commercialization of the monument. If an Independent Scientific Carrying Capacity Study on visitor load for Muir Woods and related parking & traffic proves the need for a more robust shuttle system, establish a Muir Woods Shuttle System (using small shuttle buses) that picks up and drops off Muir Woods’ visitors at regional points of origin (E.g. San Francisco, East Bay, and North Bay) and NOT within the Tamalpais Area Community Plan area. Without a parking lot, the Fort Baker ferry terminal could only be a shuttle for tourists from San Francisco and never add to traffic congestion on Sausalito streets. Even under the most intense use of a ferry – the implementation of shuttle service – would likely only add 2 vehicles per hour per direction to Bridgeway, hardly a tipping point. And, by encouraging tourists to forego car rentals entirely, it might actually cut down on the amount of vehicular traffic within Sausalito. Sausalito’s city council is standing in opposition to transit from two providers that could be vital to reducing congestion in their city and Southern Marin at large. The professed reasons to oppose either project – the scale of the GGBHTD proposal, traffic at the parking-free NPS proposal – don’t hold up to scrutiny. Thankfully, neither proposal is likely to be seriously affected. 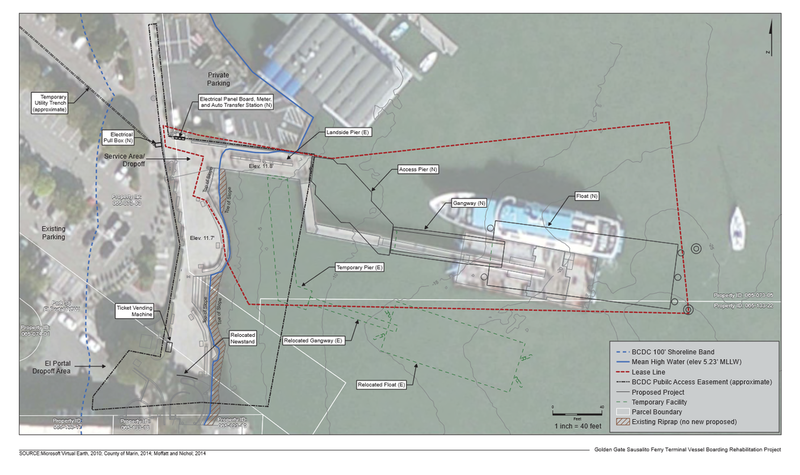 GGBHTD may modify their ferry terminal design, but the project will go ahead when the council majority – with which Pfeifer generally does not vote – is satisfied with any changes. And the EIR commissioned by Sausalito on the NPS proposal may shed valuable light on the terminal’s impact and reiterate the baselessness of traffic concerns. Sausalito and Southern Marin does have a serious tourist traffic problem, but opposing ferries and shuttles won’t help mitigate the problem.